Thanks so much for making this...it's really neat! I did have one question though -- on the bottom, there's a green button that says "I memorized a Scripture" is this supposed to be when you memorized one on Memverse, or just when you memorize a verse? 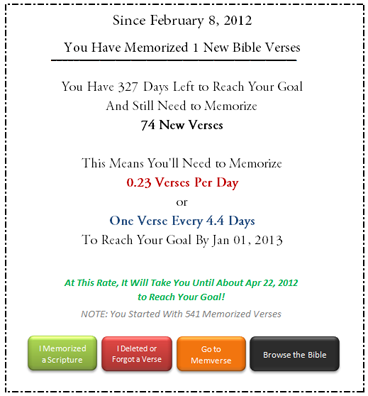 I was wondering, because it asked "how many do you have memorized on Memverse"...or something similiar to that. REVISED: Choosing when to click the green button is really up to you, although I plan on waiting until it is "officially" memorized on here before doing so to ensure that my numbers always match up with my memverse account. Whatever works best for you. 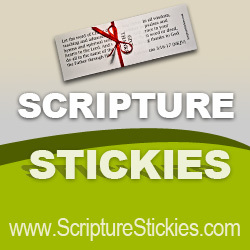 By the way, I made a point to ensure that your starting number of memorized verses is always visible since I know it can be a challenge to enter every verse you memorize without forgetting a couple here and there. By comparing this number to your current number of memorized verses on memverse, you can always tell how many Scriptures you've really memorized since starting the program. Wow! I'll have to try this! How do I start using it? Thanks again! Coolness! I'm gonna have to try it (on something other than my iPad!)! Thanks, Dakota! Click "Get it Now" (above), and when Excel opens click "Get Started." You'll be walked through the rest with prompts, etc. Dakota: It doesn't work on our Excell - it must be too old. Any suggestions? My Dad's an Excell whiz, so he might be able to program what you did into our "ancient" Excell. What version of Excel are you using? If it's from 1997-2003, try following the link below and downloading the compatibility version (click File>Download Original). Some of the features will probably be lost, but it's worth a try. Unfortunately, if you're using a version prior to '97 (there's versions all the way back to '87! ), then the only suggestion I could offer would be to update. Wow, this is really neat! Thanks! That is very cool. Thanks for sharing that with everyone, Dakota. When I click on it, I see a button that says: Click here to get started! But when I click on it, it says that my macros have been disabled. What can I do about this? It still does not work! Sorry for all the trouble! Um it doesn't work on mine. It says, no preview available or something like that. Congratulations, BBJ12!! That is very exciting! Dakota- Wow! Thank you! This is a big help. @God's Maiden of Virtue - how's your little brother? Yes, the workbook must be downloaded to work properly. Google Docs (the file host) does not provide previews of Excel files. I just noticed that, on Excel 2010, the feature which provides you with a running total of your memorized verses was not displaying properly due to the previous font size. If any of you had trouble with that, the problem is now resolved. Wow, this looks great, Dakota! However, I'm going to have to ask for some from my dad with this. I'm not the best with computers... But thank you anyway! Thanks Dakota for making this!!! It looks great. I just downloaded it and set it up with my goal. BBJ12- He is doing really well. It seems like he gets cuter everyday. WHY CAN'T BABIES STAY LITTLE!?!?!?! @God's Maiden of Virtue - I know!!!!!!! My little brother is growing up WAY TOO FAST!!!!! :) It seems like he was just born yesterday and now he's over 1 year old!!!!!!! BTW, is that you? You're pretty! BBJ12- Yes, it is. Thank you! Are you going to put up a picture of yourself sometime? I'll have to ask my mom. I did it a couple of months ago but now I have to find a good picture...again. :) I probably will...:) How old are you? Do you compete in bible bee? This is really cool! Thanks, Dakota! It will really help me to stay on track. GMOF: I really like that picture of you better than your old one. Wow, thanks! I'll have to check it out! I think it's just that my family's just to old, we're just to old school...........well, I'm only 10, so don't you think I'm a little young 4 doing this? My family's sick and grandma has cancer, (sigh) Help, Lord! Mommy's Helper and BBJ12- Thank you! I like it a lot better too! Chloe O. (choleo)- Would you like me to pray for your family and grandma? BBJ12- I am 12 years old. I did compete in the Bible Bee. I was in the Junior Timothy Track. I came in 1st place in the locals, and 22nd place nationally. I used the NIV, but I use NKJV when I read my Bible at home and at church. What version do you use? This is neat! but I can't get it......oh well. Thank you, BBJ12! I did a lot better than in 2010. We had moved that summer, so I wasn't prepared at all. Hi, Dakota, I have been using this spreadsheet as frequently as I memorize another verse. It has been absolutely wonderful! Instead of becoming disheartened, I'd prefer to be able to reduce my original goal, without upsetting the original entered values for verses already memorized and those I've subsequently added (or the occasional deletion). Or is the only way to do this is to download a new spreadsheet and start all over?